The Laois native just came up short of a podium finish. 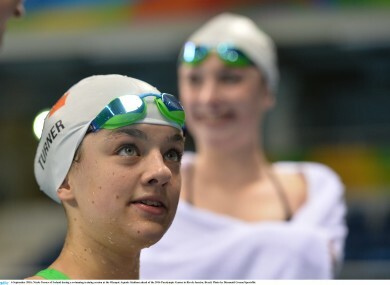 THE YOUNGEST MEMBER of Ireland’s Paralympic team defied her relative years to finish fifth in the S6 50m butterfly final with a stellar performance. Nicole Turner, just 14 years of age, was in contention for a medal at the halfway mark at the Olympic Aquatics Stadium but just came up short down despite smashing her personal best. Big things are expected of the teenager at this Games and she certainly justified those expectations with a strong swim in a time of 37.31. “It’s amazing, when I saw the clock it was unbelievable that I took nearly a second off my best time,” she said afterwards. The Laois swimmer, who already has a two silver and a bronze medal from the European Championships on her CV, is back in the pool for her S6 50m freestyle heat tomorrow at 1.54pm Irish time. Meanwhile, although Rena McCarron Rooney suffered defeat at the hands of reigning Paralympic champion, Ling Jiu this morning, she bounced back in style in the evening session of the qualifiers, overcoming Jordan’s Maha Bargouthi to book her spot in Saturday’s quarter-finals, the draw for which has still to be made. Follow The42′s coverage of the Paralympic Games from Rio here. Email “14-year-old Nicole Turner just misses out on Paralympic medal after smashing personal best ”. Feedback on “14-year-old Nicole Turner just misses out on Paralympic medal after smashing personal best ”.